Do you hold your breath when you are doing something new and challenging? To the point where you suddenly get dizzy and your heart pounds, and you think, gee, what is wrong with me–and then you breathe, and you’re like, oh. I am a perpetual breath holder. I know I do it, and there’s still no stopping. My head rings, my heart bumps. And I am trying to figure out why it is so exhausting OMG to just cut out a danged shirt?! Silly me. Breathe in, breathe out. Thus commences my first garment sewing. I’ll check in as it goes! 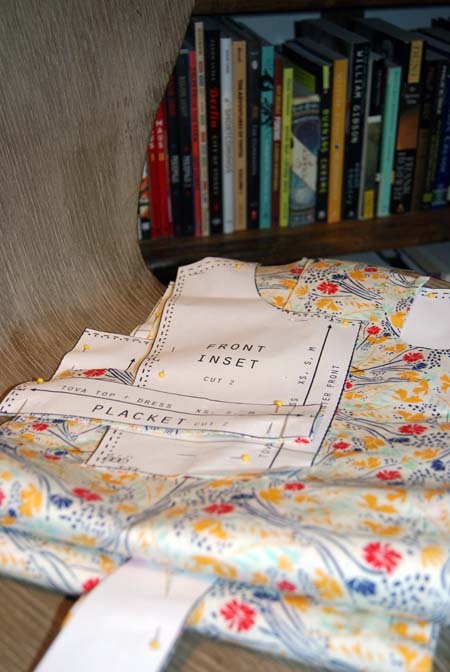 If this one turns out (this is the Maria print from Maya by Leah Duncan for Anthology–I KNOW it’s gorgeous. You should feel it, it’s unreal), then I’ll proceed with my Liberty Tova. When I made my first quilt I kept telling myself, you are born to this. My mom, grandma, great-grandmother, they all quilt(ed). Well, nobody’s a better dressmaker than my momma (except for maybe my paternal grandmother 🙂 ) so I’m born to this too, right? fingers crossed.